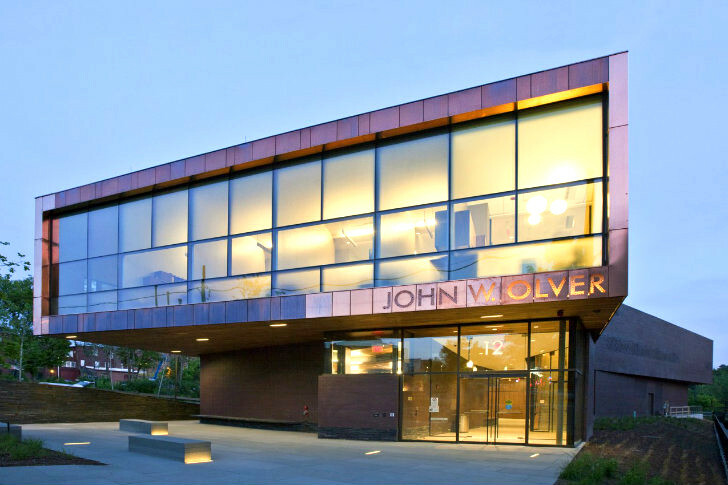 We get excited at the sight of new transit stations because they encourage even more people to take public transportation, but we really get amped when we see a station that as sustainably designed as the John W. Olver Transit Center in Greenfield, Massachusetts. It's the first transit center in the nation to be net zero energy thanks to a 7,300 sq ft photovoltaic system, geothermal heat pumps and an on-site wood pellet boiler. Designed by local firm Charles Rose Architects, the bus station provides essential infrastructure while educating passengers, and it's expected to revitalize Greenfield's downtown area. John W. Olver Transit Center by Charles Rose Architects serves as the new central bus station for the city of Greenfield in Massachusetts. The 24,000 sq ft, two-story building also features government offices on the top floor and is expected to serve as the future train depot. Highly innovative in terms of design and construction, the transit center is also respectful of the city’s historic roots. Using brick, copper and locally-sourced stone, the building’s design is a nod to the city’s downtown architecture. The western facade features a computer generated screen that minimizes direct solar heat gain, while windows were been optimally placed to maximize heat, shade and daylighting. Other strategies to further reduce energy consumption include occupancy sensors, low energy lighting, air preheating with a solar wall and geothermal system and energy heat recovery. Working closely with mechanical and electrical engineers during the design phase, Charles Rose Architects ensured they could reduce energy use and make the building net zero energy. The building utilizes 22 geothermal wells for efficient heating and cooling and a 750 MBH wood pellet boiler for additional heating. A 98 kW ground-mounted photovoltaic array supplies the additional electricity needed by the facility. John W. Olver Transit Center by Charles Rose Architects serves as the new central bus station for the city of Greenfield in Massachusetts. The 24,000 sq ft, two-story building also features government offices on the top floor and is expected to serve as the future train depot. Highly innovative in terms of design and construction, the transit center is also respectful of the city's historic roots. 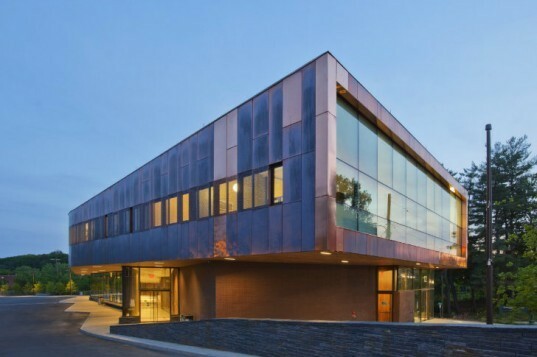 Using brick, copper and locally-sourced stone, the building's design is a nod to the city's downtown architecture. The western facade features a computer generated screen that minimizes direct solar heat gain, while windows were been optimally placed to maximize heat, shade and daylighting. Other strategies to further reduce energy consumption include occupancy sensors, low energy lighting, air preheating with a solar wall and geothermal system and energy heat recovery. Working closely with mechanical and electrical engineers during the design phase, Charles Rose Architects ensured they could reduce energy use and make the building net zero energy. The building utilizes 22 geothermal wells for efficient heating and cooling and a 750 MBH wood pellet boiler for additional heating. A 98 kW ground-mounted photovoltaic array supplies the additional electricity needed by the facility. Model of the transit center. “Zero-net-energy design has revolutionized the way we work, “ Charles Rose says. Rendering of the John W Oliver Transit Center.